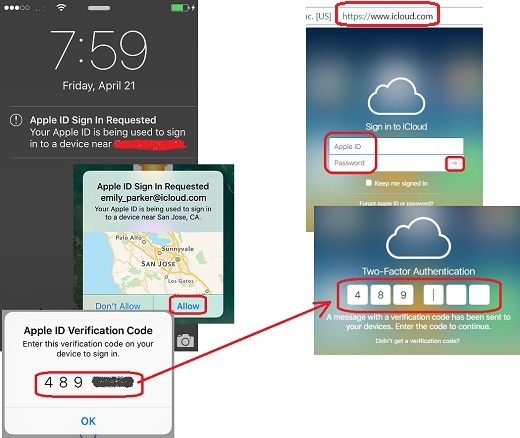 How to verify two-factor authentication setting in my Apple ID account? 1. Open a Web browser on your computer and go to http://icloud.com. your device. Enter the code to continue. 4. Enter password to unlock your iPhone. You see the same alert message displayed with a map to show you where the sign in is requested. 6. Take this 6-digit code and enter it in the Two-Factor Authentication screen on your computer. You see your iCloud home page displayed. This indicates that your two-factor authentication setting is working. If someone knows your Apple ID password and tries to sign in, you will get an alert message on your iPhone and stop it.  2019-01-30 omri turner: what happens if you lost the other trusted phone?